I love love love this Soap Dispenser. Clean and germ free. Note: As it is NOT water-resistance, please DO NOT put it near a water source and not splash on it. Otherwise, it will be rusted! 1.Touch-Free Sensor Soap Dispenser: The sensor soap dispenser of sleek modern design provides a sanitary and no-touch operation. It dispenses soap automatically only when you put your hands near the nozzle, offering great convenience! 2.Adjustable Volume: The volume of the dispenser is adjustable and supports 3 modes ( low, middle, large ), allowing you to control the amount of soap that is dispensed for the perfect hand washing. 3.Works with Any Liquid & Easy To Refill: The soap dispenser work great with any liquids: your favorite liquid soap, hand sanitiser, disinfectant, shampoo or shower gel. You can easily refill whatever favor you like. It is also easy to refill and easy to clean. 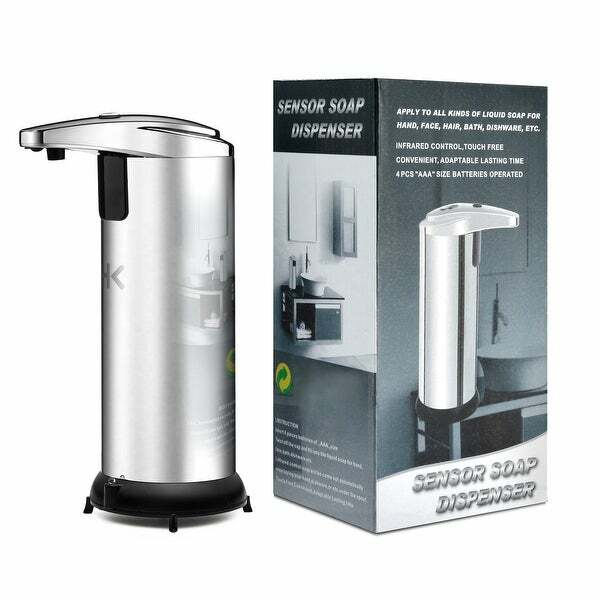 4.Waterproof & Durable: The awesome soap dispenser is made of stainless steel and high technology, which makes it durable and can last for long time. It also has a special mount at the bottom that resists water and damp well. 5.Use in Various Occasions: The dispenser will stay looking good due to its no-fingerprint and smudgeproof coating. The brushed stainless steel looks fabulous on any bathroom or kitchen sink. It works great in any bathroom, kitchen and laundry. 1.PUT 4 AAA BATTERIES INTO BATTERY JAR ON THE BATTOM. 2.UNSCREW THE LID,PUT HAND SANITIZER INTO CONTAINER AND SCREW BACK THE LID TIGHTLY. 3.PRESS AND HOLD ON/OFF BUTTON ON THE TOP UNTIL INDICATOR LIGHT ON,PRESS BUTTON THREE TIMES SEPARATLY TO ADJUST THE VOLUME OF SOAP. 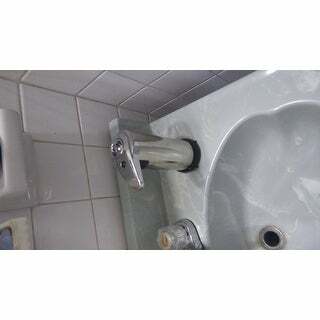 4.PUT YOU HAND INTO SENSOR ZONE AND DISPENSE SOAP. Image Automatic Sensor Soap Dispenser is a smart sensor liquid dispenser designed for all families. The smart motion sensor technology provides a sanitary and touch-free operation so that it can automatically dispense liquid when you put hands near the nozzle. The volume is adjustable, allowing you to control the amount of soap for perfect hand washing. Made of durable stainless steel and with waterproof mount, it is also anti-damp and can last for long time. It stays looking good due to its no-fingerprint and smudgeproof coating. You can fill in not only liquid soap but also hand sanitiser, shampoo and shower gel, offering great convenience in any bathroom, kitchen and laundry. I bought this to place at my sink so I could get soap on my doing without having to touch the dispenser. I love the fact that It has 3 different dispensing about. Great price for a good product. This is a great piece to add to the bathroom. A no touch soap dispenser is great. You must use a thinner consistency of soap though. Nothing tragic. I love my soap dispenser...it works great, once you figure out how to set it up. Make sure you put the bottom feet on it as if it gets wet (like mine did) it will get the batteries and compartment wet and stop working. Thank goodness I let it dry out for 5 days and it started working again. (it did stop working altogether after getting wet and I thought it was ruined as the wires on the bottom got wet) Now that it's all figured out, I think it's great! Not expensive and very nice works fantastic. The only difference between this one and Simplehuman is that it is less quiet. That's fine my family actually likes the sound. No more squeezing or pumping down and no more mess. Thanks Overstock!! I ordered 2, one worked and one didn't. The one just kept running and running and leaked all the soap out on to the counter. The one that does work good, needed it's batteries replaced within the first week. Great product, only exception is the reservoir us small. if i could give it zero stars I would. Soap doesn't properly disperse even after multiple battery changes. Would not recommend. Easy to set up and super sensitive! didn't work at all. tried to return and was a huge hassle. I don't recommend this product.